Newark is home to cultural, historical and natural treasures that will entertain, amuse and educate. Highlights in Newark and the surrounding area include golfing, fishing, shopping, the Blackhand Gorge State Nature Preserve, the historic Buckingham Meeting House, the National Heisey Glass Museum, the Newark-Granville Symphony Orchestra, and the Downtown National Historic Register District. Long before the first settlers arrived in the Newark area, it had been populated by a large population of Mound Builders. Later numerous Native American clans used the area for gathering flint and hunting. In 1802, Samuel Elliott and Samuel Parr built the first cabins in what would later be called Newark. By 1804, approximately 20 families lived in Newark. In 1808, residents constructed Licking County's first courthouse. It was located on the same site where Licking County's courthouse is today. The original courthouse was a log structure that also served as a church. In 1817, Presbyterians built the first separate church in the community. In 1830, Newark had a population of roughly 1000. In 1840, the population had almost tripled to over 2,700 people. Most residents earned their living from agriculture in Newark's early years. By the late 1840s, the town was home to 3 newspaper offices, ten grocery stores, two gristmills, an iron foundry, a wool factory, a bookstore, two hardware stores, as well as several other business establishments. Construction of the Ohio and Erie Canal began just south of Newark at Licking Summit in 1825. The canal led to local prosperity in the 1830's and 1840's. The Webb House Museum houses a family collection of antiques and art. Built in 1907 in the Arts and Crafts style, the interior of the house features beautiful wood paneled walls. The home still maintains the look of a private residence. Visitors may also enjoy the cottage gardens that feature many heirloom flowers. Hours: April-December, Thursday, Friday, Sunday 1-4 p.m. or by appointment. The Interpretive natural and cultural history offers displays where children and adults can get "up close and personal" with Licking County's "wild side." Research library and reservable conference room. A unique hands-on replicated archaeological dig site for kids and adults. "Wild Side" Exploration Kits for families, community groups and other visitors. A Hopewell Indian Burial Replica and model of the historic Rutledge Burial Mound. The Nature Center also has the Rookery Gift Shop. Built around 1820, this museum was owned by only 2 families until 1947 when it was slated for demolition. Saved, moved and restored by the Licking County Historical Society, the house now features fine architectural details. Furnished with items from Licking County's past. Located in Veterans' Park. Hours: May-December, Tuesday-Saturday, 1-4 p.m. or by appointment. 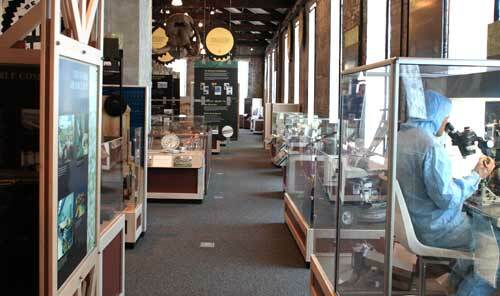 Develop an appreciation for the local Licking County history at The Works. The museum occupies the former Scheidler Machine Works factory building, built in 1861 for the manufacture of steam engines. Displays included a renovated interurban car, an operating wood shop and print shop plus rotating exhibits through its affiliation with the Smithsonian Institution and other national museums. The Great Circle Earthworks, formerly known as Mound builders State Memorial, was built by the Hopewell culture approximately 2000 years ago. The circle is nearly 1200' in diameter and used as a vast ceremonial center by its builders. The Great Circle is one part of the Newark Earthworks State Memorial, the largest system of connected geometric earthworks built anywhere in the world (Great Circle Earthworks south of Newark, off State Route 79 between Parkview Drive and Cooper Street). Octagon Earthworks and Wright Earthworks are both additional local sites that preserve other features of this majestic remnant of prehistoric Ohio. A new visitor center will open in Spring 2008. Located at the Cherry Valley Lodge along Route 16 between Newark and Columbus, has opened as a 50,000 square foot indoor water park. Inspired by Key West, Florida, yet a close to home getaway with 3 body and raft slides, water cannons, whirlpools, a Dip-in theater, Wet Rooster Bar, Key Quest Arcade, Cherry Valley Lodge rooms and suites, a restaurant, and more. The pet friendly Arboretum is 1700 acres of over 15,000 living plants, hardy to Central Ohio. You can walk the 8 miles of trails, or take a relaxing 4 mile auto tour through the park. Every season brings a different view. Dawes Arboretum is located just south of Newark. Originally founded as Granville College, Denison was later named after a local farmer named Denison after he donated a considerable sum to the College. Founded as a Baptist institution, Denison for many years enjoyed the support of John D. Rockefeller, who sat on the college's board of trustees until the institution mandated that all trustees be Ohio residents. The campus is about 1,200 acres including a 500 acre biological reserve just east of campus. See the worlds largest basket that is actually the home corporate office of the Longaberger Basket Company. The basket is a replica, 160 times larger, of Longaberger's Medium Market Basket. It's 192' long by 126' wide at the bottom and spreading to 208' long by 142' wide at the roof line. Granville Inn is a historic English manor inn, and a landmark, in the heart of Granville. They offer a full-service restaurant and pub, guest rooms and suites along with banquet, meeting and catering services. Listed on the National Register of Historic Places, the inn’s old-world charm, hand cut oak paneling, native sandstone and rural hospitality make it a place for great escapes. Built in 1812, the Buxton Inn has been carefully restored and currently has 25 overnight guest rooms furnished in period antiques, with private baths, central air. The Buxton Inn also has dining and meeting rooms ranging in sized form twelve person to sixty person capacity. Lunch, Dinner and Sunday Brunch are offered year round, offering fine American/French cuisine to suit any taste. The Buxton Inn is reported to be haunted. 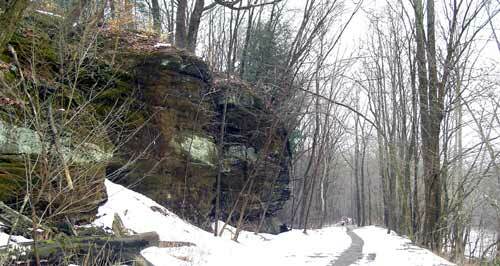 Blackhand Gorge State Nature Preserve is a 970-acre area dedicated as an interpretive nature preserve in 1975. This dedication process ensures that the area’s scientific, educational and aesthetic values will be preserved indefinitely for use by all Ohioans. The name “Blackhand,” for which the preserve is known, originated from a large, dark hand-shaped petroglyph that was engraved on the face of the sandstone cliff. Many Indian legends were passed on to early pioneers about the origin of the “black hand.” Possibly the most prominent is the one that says the hand marked the boundary of a sacred Indian territory where no man was to raise his hand against another. The engraving was destroyed during the construction of the Ohio-Erie Canal towpath in 1828 when canal builders dynamited the cliff face. Located in Licking County 8 miles east of Newark on State Route 16, exit southeast on State Route 146 and proceed 1/4 mile to County Road 273. In 1860, David Wyrick of Newark found an inscribed stone in a burial mound 10 miles south of Newark. The stone is inscribed on all sides with a condensed version of the Ten Commandments or Decalogue, in a peculiar form of post-Exilic square Hebrew letters. The robed and bearded figure on the front is identified as Moses in letters fanning over his head. The stone measures almost 7" in height. The mystery is: what was a carved Jewish stone doing inside an Indian mound that was estimated to be somewhere between 800 - 1200 years old? Today, both the Decalogue Stone and Keystone, or "Newark Holy Stones," as they are known, are on display in the Johnson-Humrickhouse Museum in Roscoe Village, 300 Whitewoman St., Coshocton. Plaster casts of the Decalogue stone and Keystone may be purchased from the Museum. Are they real? Or just an elaborate hoax? Archeologists believe the stones were hoaxes perpetrated to validate David Wyrick's view that the Mound Builders were actually the lost tribe of Israel. They cited that the alphabet used was a later version of the Hebrew alphabet, but that just means that the carving was done after the date in question. If the stones are real, could it be that they were just trade items that one group of travelers exchanged for goods? We have this belief that all contact with the new world only came after Columbus' arrival. It is quite possible that a number of earlier explorers reached this land long before that date and they may have brought religious items along with them that may have ended up in someone's grave. The statue of Hal Holbrook in character as Mark Twain is a life-size bronze sculpture located outside the box office of the Midland Theatre in downtown Newark. The sculpture was created by Gary Lee Price Studios in Springville Utah, and purchased by the Gilbert Reese Family Foundation in 2003. Hal Holbrook, who was born in Cleveland, was a student at nearby Denison University. The Midland Theatre first opened in December 1928. The grand opening was a much anticipated event in Newark and a long line formed around the block waiting for the doors to open at 6:30 P.M. and that blustery Thursday evening. Seating capacity when it opened was approximately 1800. The building was designed by Harry C. Holbrook of Columbus. Dave Longaberger and the Longaberger Company purchased the Midland in the 1990s and invested a considerable amount of money in the restoration of the Midland. The facility re-opened in 2002.